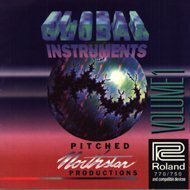 Global Instruments Volumes 1 and 2 from Northstar are CD-ROMs for the Roland S-770, which incorporate a total of 85 banks of digital instrumentation. And with it, you can have the world. That's right, sounds from all over the world. Volume 1 focuses on pitched ethnic and world instruments including accordions, banjos, bagpipes, kotos and pan pipes. Volume 2 gets you all the percussion instruments from Africa, Japan, Korea, South America, the Middle East and India. All acoustically generated sounds. No electronics. And at $149 each, that's less than $5 per bank. Northstar is known for detail and they've left nothing out. Each bank meticulously sampled with many instruments at 4 and 5 velocity levels; all the sampled nuances to capture the real instrument. Northstar includes many sampled performances of an instrument as well, all to bring the real power of the S770 to life. Global Instruments are available on CD-ROM for the S-770 and compatible devices for $149 each.